The Architect – Precisely. As you are undoubtedly gathering, the anomaly is systemic, creating fluctuations in even the most simplistic equations. On this blog and in quite a few conversations, I have pointed out the risks of overtly relying on cohorts or grouping of employees to formulate an employee engagement strategy. Using segments and cohorts to understand broad behavior and drivers of engagement is okay, but trying to engage the individual based only on those conclusions is not the best approach. As ‘Neo’ puts it in the movie Matrix Reloaded , the ‘problem’ is Choice or to be more accurate, in this case – individuality. Every employee is an individual with her own priorities, preferences, fears and responsibilities. Work, forms an important part of an employees life – and the emphasis I place is on ‘part’ and not on ‘important’ because that aspect is the one that often gets missed out when employee engagement strategies or initiatives are designed. As an individual with family, friends, interests, hobbies, ambitions and aspirations – responsibilities at work represent just a fraction of the things that matter to the employee. There are a bunch of things that are important to the employee (health, financial well being, spending time with family, a social life, learning new things, new experiences) and there are things are important to the organization (employee well being, profits, playing an important role in the society, innovation). 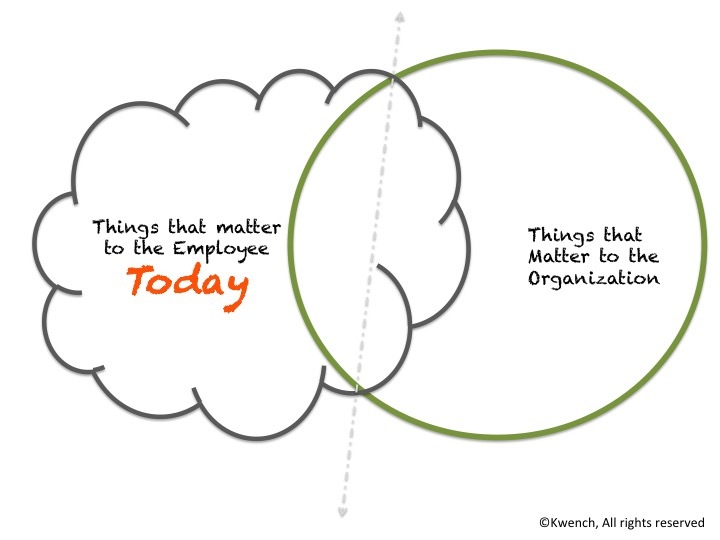 When an employee is at work, he is operating in the intersection of these two spheres – there are things that matter to him which align with what matters to the organization. 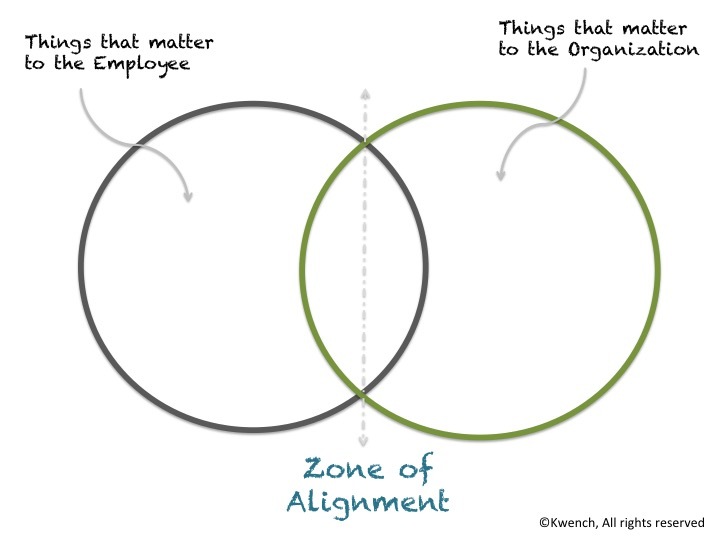 When this overlap is driven by the correct factors (alignment on the larger picture, the direction the company is taking, quality of work, the work culture etc. ), there is a zone of alignment that is sustaining (and empowering). 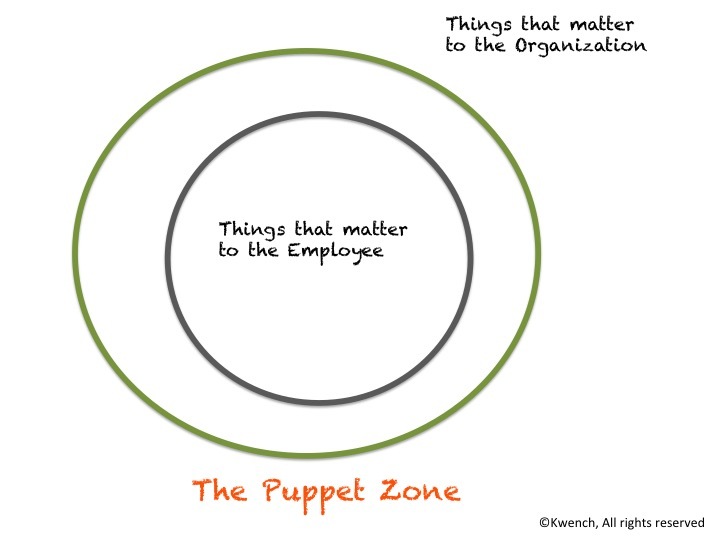 When what matters to the organization (as perceived by the employee) starts to drift away from what matters to the employee as an individual, this overlap reduces, the zone of alignment starts to shrink and becomes unsustainable. This is when disillusionment sets in eventually leading to Disengagement if corrective measures are not taken. A situation where an individual is completely (and only) aligned with what matters for the organization makes him dysfunctional in other things that should matter to him. If the last line reminds you of the uptight, always-on-the-edge, hard driving, ranting and screaming executive, you are bang-on. The other (unintended) consequence of such a situation is that individual then subsumes his discretion to what seems best for the organization. Being too focused on one aspect inevitably leads to a myopic vision of what is correct. It is the healthy balance of all aspects in ones life that helps drive a balanced approach towards challenges – both personal and at work. A ‘super-mom’ I know uses negotiation skills learnt at work with her 1-year-old infant (works most of the time) and then takes the lessons learnt from handling the concerns of parents, her husband, siblings back to work to engage with her multi-generational team. Imagine what would happen if she tried a time-sheet driven approach with her infant or never took time out to spend time with her parents or spouse but focused only fixing “issues” at work (of which there never seems to be any dearth). Unlike organizations, what ‘matters’ to an individual is in a state of flux. I am not talking of value systems, or ambitions – those are (hopefully) rather fixed. I am referring to the drivers of what is a priority. Companies and Institutions have stated goals at time of creation and (usually) those drive everything they do. People on the other hand have changing preferences and changing events and these affect the overlap and consequently the alignment they have with the organization. 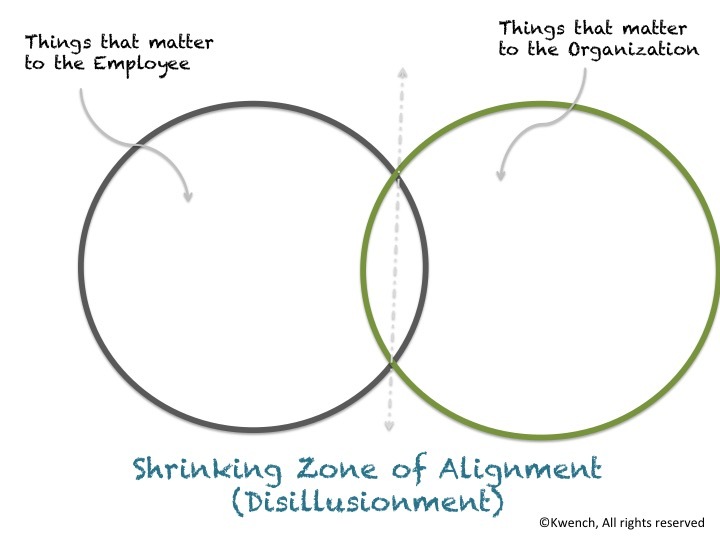 If the organization stays rigid on how it interacts with the employee, then the extent of alignment is bound to change. Again an increased degree of alignment is not necessarily a good thing. A few years ago I got chatting with a senior executive at a party. He was really good what he did, and totally disengaged. He was so efficient at what he did that the organization was reluctant to consider what his own personal aspirations were and had kept him doing the same thing for years on end. 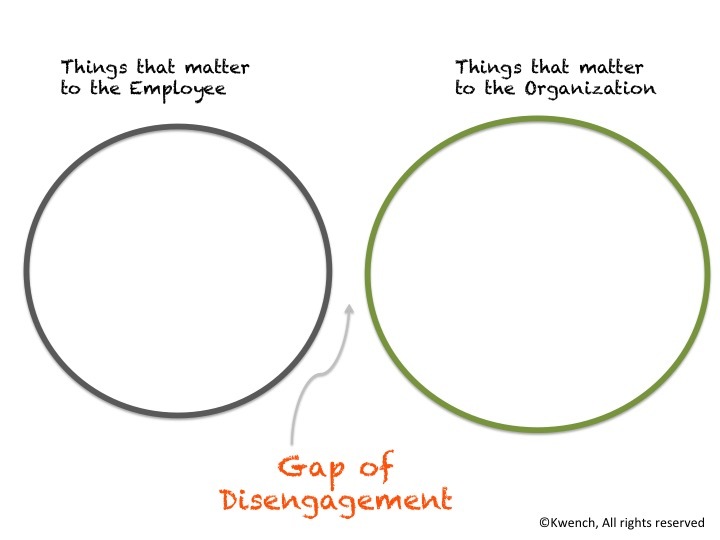 “The Gap of Disengagement” was very clear and he was looking to quit because he realized that by staying on he was damaging himself and the organization through his disengagement. I ran into him two years later in a busy airport and was surprised that he was still with the same organization in the same role. When I quizzed him, he confessed that he was still disillusioned but a personal crisis had made it impossible for him to look for other possibilities. His efficiency gave him more time at home and so he compromised his ambitions to stay on with his employer. The executive’s alignment with his employer had increased, but it was driven purely by convenience. Smart organizations would avoid this situation by being aware of various dimensions of what drives each employee. DIY Pulse surveys are a good way; Managers who listen to their team members and do something about their concerns are even better. A static employee engagement program is not enough neither is a “one-size-fits-all” approach. Like ‘generically designed’ antibiotics can have unexpected nasty side-effects in patients, employee engagement strategies designed for ‘masses’, ‘cohorts’ or ‘segments’ can induce the reverse effect. The pharmaceutical industry has woken up to the importance of pharmacogenomics to counter the ill effects of ‘universal-design’ for medicines – its time for HR professionals to follow suit.